when leaving Fastnet Rock south by east, you will find clear water to 6m for a distance of 4km you will find the stone-light at spyglass on your bow. Bear N’ward to enter The Channel and leave the island at pslande on your st’bd for 2km. Bear N by N.E. and leave the Lighthouse at Dex, a white tower showing red flashing every 4 seconds, on your st’bd at 300m. As you enter Heckendorf steer N by W to cross into the treacherous Four Corners until Mapple maintaining a n’westerly course until you enter Dire Strait on that heading for 1.5km. In 1884, New York only had one crossing of the east river to the City of Brooklyn. This well-found bridge would last centuries as an icon of a city full of potential, and is respected as a feat of engineering. 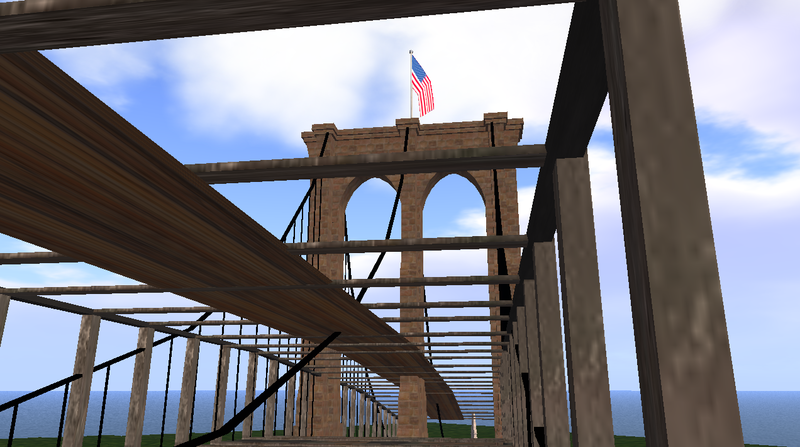 When Pan asked me to help build her vision of Old New York in InWorldz, I jumped at the chance.